Mr. Shearer has over 30 years of experience in the trust and investment industry of which 20 years have been with Old National Wealth Management (formerly Tower Trust Company). He earned a B.S. in Finance from Indiana University in 1986 and completed the Chartered Financial Analyst (CFA) program in 1994. Gary has been very involved in community activities over the years, having served as Board Chair for the Jorgensen Family YMCA, the Boys and Girls Clubs of Fort Wayne, the Mustard Seed Furniture Bank and Visit Fort Wayne. 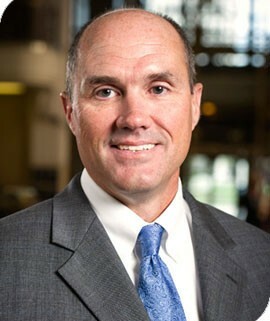 He serves as a member of the IBA Trust Committee, the Mustard Seed Furniture Bank Board Development Committee, the Endowment Fund Committee of Christ’s Community Church, the CFA Institute and the CFA Society of Indianapolis. Senior Vice President, Client Advisor Manager – Old National Wealth Mgmt. Executive Vice President – Tower Financial Corp.
Visit Fort Wayne – currently serves as a member of the Board. Mustard Seed Furniture Bank of Fort Wayne, Inc. – currently serves as a member of the Board Development Committee. Christ’s Community Church – currently serves as a member of the Endowment Fund Committee. Gary has been married to wife Laura since 1989. Two children; Parker age 27 and Amanda age 25. Born and raised in Marion, IN and has been a lifelong resident of Indiana. Enjoys spending time with family, the outdoors, fishing, water skiing, wake boarding, snow skiing, “tinkering” around the house and garage, and rooting for IU basketball/football, the Colts and the St. Louis Cardinals.